Oh, where to start… the past two weeks have certainly been hectic. Both Roo and Tigger celebrated their birthdays last week which meant I was dashing here there and everywhere ordering birthday cakes, booking restaurants and last-minute wrapping etc. Added to this I’ve finally been given my c-section date (more on this later) and then a false labour which resulted in a middle of the night dash to the hospital. I’ve been busy getting things ready at home just in case Piglet doesn’t fancy waiting until my c-section date. I’ve unboxed my Tommee Tippee Perfect Prep Machine, honestly, it looks amazing and I’ve already given it a test drive (this is going to be fabulous for the night feeds). The car seat is set up and ready in the car, I just need to open up my Silver Cross Wayfarer pushchair and put that together (which from what I have seen on YouTube is very easy to do). I haven’t felt too bad over the past few weeks, niggling back pain especially when I have been on my feet for a while but other than that I can’t complain too much. I’d love to be able to sleep better on a night but I think that is my body getting ready for the upcoming sleep deprivation. Eating regularly is the key to feeling well I have found. Instead of eating large meals I am trying to stick to smaller meals but more often that way I don’t get the heartburn and sickness feeling I have been experiencing. Having had my appointment booked to see my consultant for a few weeks I was prepared with some questions about my pending elective caesarean, however when I eventually got through to see the consultant (how they can be running 50 mins late after only an hour into clinic is beyond me) it was, in fact, a locum. From the moment I walked into the room I didn’t click with him, I said down and we both looked at each other and for what felt like an eternity neither of us said anything (so awkward). Eventually he asked what he could do for me and I explained I was there to book the date for my elective caesarean which he gave me a date, I explained that I was measuring larger for my dates and that I had big babies etc. but he didn’t seem that interested although he finally agreed to re-scan me to get a better measurement of Piglet. I also mentioned that I’d had a recent UTI and that my community midwife had sent off another urine sample and some blood the week before which I wasn’t sure whether he had the results of. He looked them up on the system and noted that I am was anaemic and asked whether I was taking iron supplements which I said that I was, three times a day since 28 weeks. He looked back at a previous blood result and could see that my levels have risen since I started on the iron tablets and commented ‘oh yes, I can see that you are taking your iron tablets’ which made me feel like he didn’t believe me when I said that I been taking them (why I would lie about something like that?). When I enquired about how long I was likely to be kept in following my elective caesarean he said ‘oh between 24-48 hours’ which immediately put my anxiety levels up. After explaining the difficulties I’d had with both Roo and Tigger’s birth I stressed that I was worried about being discharged too soon as I didn’t want to be readmitted again. He made me feel as though I was requesting a hotel room for the night and that the hospital would only keep me as long as necessary – I honestly didn’t know what to say to him. 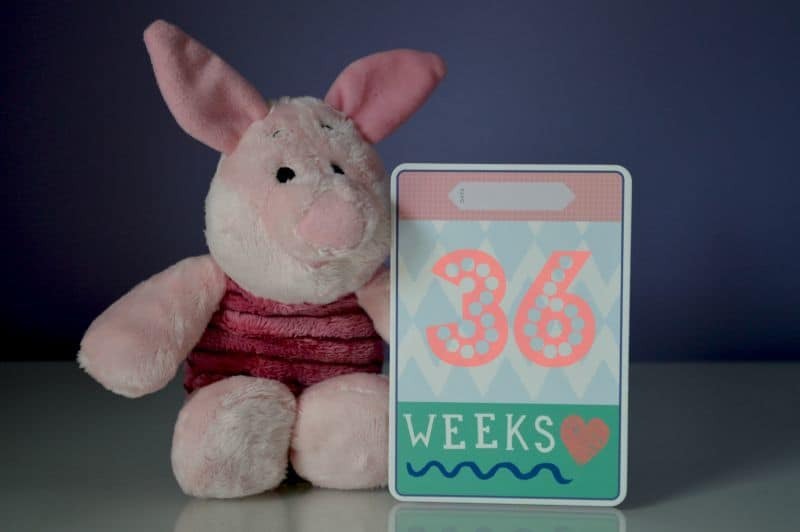 After a growth scan to check Piglet they noted that she was around 6lb in weight already at 35 weeks and was, in fact, measuring 37 weeks – the consultant, however, was not concerned by this and has kept my elective caesarean date the same and that was that. I left feeling disheartened and that my concerned may have been heard but not taken into account – fingers crossed I don’t have to see him again. I have the exact same appointment, to book a date for my section, except mine is on….. you won’t believe this… New Year’s Day. I really need to ring the hospital and check if that is correct. I hope my chap has more emotion and sensitivity that yours 🙁 I know what you mean, as with Aaron the section was Tuesday night and I did not come out of hospital till the Saturday, so 24-48 hrs seems BONKERS. It’s major surgery. If he is a locum, he probably isn’t typical of the service that you WILL receive. Staying upbeat and all that, and praying for you too. I also have a bump that’s measuring large and an extra scan, which will be on 7th December. You sound a lot more organised than me. I really want to sort a buggy and that perfect prep machine too. I think we will use Aaron’s car seat but I need Daddy to get it down from the attic. I have just tweeted Cosatto to see if there is any chance they can provide screws for the cot as hubby doesn’t know where he put them when he dismantled it.